Has anyone ever heard this story before? This is straight out of a “strange but true” chapter of American History. I know this has nothing to do with the Smoky Mountains or the outdoors, but it’s so bizarre, I had to point it out. I caught wind of the story while watching Good Eats on the Food Network earlier this week. 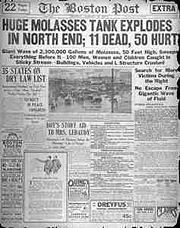 As the story goes, in January of 1919, a 50-foot-high steel tank, holding 2.3 million gallons of molasses, burst and sent a wave of molasses rushing down Commercial Street in the North End neighborhood of Boston. The gooey surge killed 21 people and injured at least 150. Moving like hot molten lava, a 15-foot wave of molasses, moving at an estimated 35 mph, buckled the elevated railroad tracks, crushed buildings and inundated the neighborhood. It even lifted a train off its tracks. Several blocks of the neighborhood were flooded to a depth of 2 to 3 feet. Most of the people who died were crushed or drowned in the molasses. There’s one story of a firefighter who became trapped underneath his crushed firehouse. He was able to keep his head above the molasses for three or four hours before he finally succumbed and drowned. The tank was owned by the Purity Distilling Company who used the molasses for the production of rum and industrial alcohol. It took over 87,000 man hours to clean the sticky mess from the cobblestone streets, theaters, businesses, automobiles, and homes. Boston Harbor was still brown with molasses until summer. 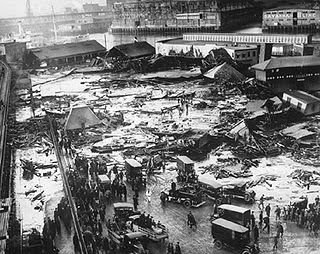 The Great Molasses Flood, as it became to be known as, has entered local folklore. Some residents claim that on hot summer days the area still smells of molasses. The 2009 Southeastern Foot Trails Coalition Conference will be held in Kentucky from May 7 thru May 10. Meetings and some activities will take place at Pine Mountain State Resort Park in Pineville, KY. Other activities will be held at nearby Cumberland Gap National Historical Park, including guided hikes led by park staff. The conference will include educational sessions and group breakout discussions. There will also be social activities including a square dance on Friday evening and a visit to the Hensley Settlement in Cumberland Gap NHP on Saturday evening for a cookout and some night sky / night hike activities. A special public ceremony is planned to recognize the connection of the Cumberland Trail and the Pine Mountain Trail at Cumberland Gap as well. Registration is now open. For more information, please click here. If you have questions, please contact Dennis Crowley at dennis.crowley@win.net. The annual Spring Wildflower Pilgrimage in Great Smoky Mountains National Park will take place from April 22 thru April 26 this year. The pilgrimage is a five-day event consisting of a variety of wildflower, fauna, and natural history walks, motorcades, photographic tours, art classes, and indoor seminars. Most programs are outdoors in Great Smoky Mountains National Park, while indoor offerings are held in various venues throughout Gatlinburg. There will be more than 150 programs this year. Registration begins on March 9. Fees for adults are $25.00 for one day; $40.00 for 2 or more days. Student fees are $10.00 for one or more days and children under 12 years of age are free. For more information, visit www.springwildflowerpilgrimage.org or phone 865-436-7318 (ext. 222). The Smoky Mountains are home to more than 1600 species of flowering plants. Wildflowers explode during the brief window just prior to trees leafing out and shading the forest floor (from about mid-April thru mid-May). Need help identifying all those flowers? 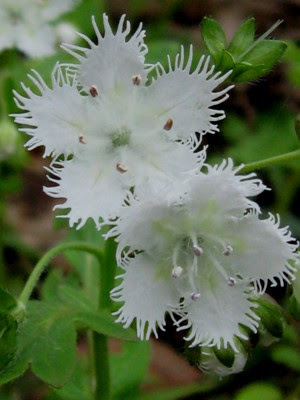 Check out Southern Appalachian Wildflowers. This would be a nice companion to have during the pilgrimage to help you identify the many wildflowers you'll be seeing. This field guide features wildflowers from the southern tip of the Appalachians in Georgia and Alabama to the Blue Ridge Parkway and includes Great Smoky Mountains National Park. Please click here for more information. American Trails, the only national, nonprofit organization working on behalf of all trail interests, announced the winners of its 2008 American Trails Website Contest today. Among the several categories awarded in this year's contest, HikingintheSmokys.com was named the best website for Trails on Federal Lands. HikingintheSmokys.com has prided itself on being the most comprehensive resource for free hiking trail information for Great Smoky Mountains National Park. Our site offers details on more than 70 trails in the Smokies, including trail descriptions, key features, pictures, video, maps, elevation profiles, news, and more. Other categories in the contest include best Travel and Tourism site for trails, best Community Trails System site and best State Agency site. The goal of the annual contest is to publicize the excellent work that trails and greenways enthusiasts are doing across North America. American Trails looks for sites that make trails come alive, provide effective information delivery, support volunteers and engages the public. Ultimately, American Trails wants to showcase ways that advocates and agencies are making a difference for trails. American Trails will be highlighting the contest winners in its’ upcoming American Trails Magazine, in the next eNewsletter, as well as on the organization’s website. Since 1988, American Trails has worked on behalf of all trail interests, including hiking, bicycling, mountain biking, horseback riding, water trails, snowshoeing, cross-country skiing, trail motorcycling, ATVs, snowmobiling and four-wheeling trails. They support local, regional, and long-distance trails and greenways, whether they are in backcountry, rural or urban areas. Their goal is to support America's trails by finding common ground and promoting cooperation among all trail interests. I would like to thank American Trails for providing a venue to showcase all of the trail websites that entered the contest. The Smoky Mountain Field School recently published its 2009 schedule. The Field School is a partnership between Great Smoky Mountains National Park and the University of Tennessee. For more than 30 years the school has offered high-quality workshops, hikes, and adventures to more than 750 people each year who want to enhance their enjoyment, appreciation, and understanding of the Smokies and the great outdoors. These courses and events do include a fee. For more information on these events, and to see the full schedule, please click here. Backpacker Mag Reader's Choice Awards: TN and NC? Backpacker Magazine recently published their 2009 Reader's Choice Awards. As part of the magazine’s annual awards, the best hike in each state is voted upon by their readers. After reviewing the list, I have to admit that I have a bit of a bone to pick with the choices made for Tennessee and North Carolina. Obviously, this list is based solely on reader’s opinions. If, for whatever reason, there weren’t a significant number of people who voted, then there’s a chance that many of the best trails were overlooked. For Tennessee, readers chose Rainbow Falls in the Smoky Mountains as the best hike in the state. I agree, this is a very nice trail, but it’s not even the best hike in the Smokies. What about the Alum Cave Trail to Mt. LeConte? Or, how about Charlie’s Bunion, Rocky Top, Mt. Cammerer or even Gregory Bald? Perhaps these last four choices didn’t make the cut because the trail and/or destination lies along the border with North Carolina, thus causing some confusion as to which state these trails actually belong in. I also had a beef with the selection for the best hike for the State of North Carolina. Readers chose Big Creek in the northeast corner of the Smoky Mountains. Again, this is a very nice hike, but I don’t believe it’s the best hike in the Tar Heel state. Personally, I would’ve chosen the Grassy Ridge Bald hike near Carvers Gap in the Roan Mountains. I would’ve even accepted Hemphill Bald or Max Patch as better choices. Maybe I’m just partial to big views. What are your thoughts? Do you agree with Backpacker’s readers, or do you have a couple of other favorites that you think should’ve made the list? According to staff employees, the date for the annual LeConte Lodge helicopter resupply will be on Monday, March 16 this year, weather permitting. Restocking the wilderness lodge atop Mt. LeConte in Great Smoky Mountains National Park requires some fairly unique solutions. With no roads anywhere near the mountain, the Lodge uses llama pack-trains to carry certain supplies throughout the season. 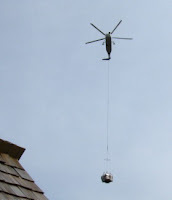 However, just prior to the beginning of each new season, the Lodge is resupplied by helicopter with the heavier equipment and cargo that can’t be transported by llamas. During the annual airlift, a Sikorsky S-61 helicopter will ferry roughly 200,000-lbs. of supplies and equipment for the upcoming season, including items such as propane tanks, maintenance equipment, canned foods, wine, t-shirts and other souvenir items. The supplies are ferried over from a staging area at the Luftee Overlook parking lot, 3/4 mile from the Newfound Gap parking lot. The helicopter roughly follows the Boulevard Trail as it makes its commute back and forth to Mt. LeConte. The Sikorsky helicopter, operated by Construction Helicopters out of Ypsilanti, Michigan, is roughly 59 feet long, and has a rotor diameter of about 62 feet. The twin turbo engine can lift about 7000 pounds, and flies with two pilots, each of which has a bubble window that they use to peer out to see where their load is hanging. After dropping off its load, the chopper returns to the staging area with trash or empty propane tanks from the previous season. After each drop-off, the palettes are quickly emptied. Lodge employees form bucket brigades to move the new supplies into different buildings while others move the cargo nets and empty pallets, and ready them for the next flight. For anyone interested, the Lodge always appreciates volunteers for the bucket brigade. It’s a great way to spend some time on the mountain. You can visit this page for more information about hiking up to the top of Mt. LeConte. My only hope is that Slavomir Rawicz, the protagonist in this story, hasn’t pulled the wool over the eyes of people like me or Mr. Ambrose. Slavomir Rawicz was a cavalry officer in the Polish army when he was captured by the Red Army during the German-Soviet partition of Poland in 1939. After being tortured and put on trial in Moscow, he was sentenced to 25 years of hard labor in a Siberian Gulag. When I originally set about creating this list, I intended to compile a list of only the top five survival stories. However, as I was browsing through my library, I realized that I needed to expand the scope of the list to include Lance Armstrong’s first book. I recalled the significance of It’s Not About the Bike, which was in the message that Lance conveys throughout his book: that no matter how much the odds are stacked against you, whether it’s cancer, or any obstacle in life, you should never give up the battle. Lance clearly demonstrates his deep will to survive in this book. I believe this strong will, his attitude, and his courage can be applied to wilderness survival situations. We Die Alone recounts Baalsrud’s incredible and improbable escape and his iron will to survive. Poorly clothed, with one foot entirely bare, and part of his big toe shot off, Baalsrud is relentlessly pursued by the Nazis. Originally, Krakauer went on assignment for Outside Magazine to report on the growing commercialization of guided trips up Mount Everest and the inherent danger to unsuspecting clients. Instead, he wound up writing a first-hand account of the disaster that unfolded after a ferocious storm blasted Everest with gale force winds and killing eight climbers. My fears, as I discovered, were unfounded. Nando Parrado, the hero and author of the book, spent relatively little time discussing the details surrounding this part of the story. Although he suffered a fractured skull, was unconscious for three days after the crash, and was presumed to ultimately succumb to his injuries, Parrado was able to revive. After several weeks of recovery, he eventually devised a plan and led a team over the 17,000-foot peak that trapped the survivors on a glacier, and marched ten days to rescue and freedom. 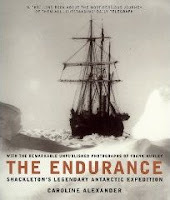 Before the expedition was able to reach the continent, their ship, the Endurance, became stuck in an early ice floe in the Weddell Sea. The crew of 27 had no means of communication or hope of outside help, and was to remain isolated for next 22 months. This incredible book is also accompanied with the previously unpublished photographs of Frank Hurley, a member of the expedition. We have a couple of new additions to our HikingintheSmokys.com website I’d like to share. The first is our new Appalachian Trail pages. The combined two pages offer detailed information on hiking the Appalachian Trail through the Smoky Mountains, including information on key points along the way, backcountry shelters, water sources, mileage data, an elevation profile, a brief history of the trail, as well as other key online resources. Please click here to visit the page. We’ve also added a page that provides a list of suggested road cycling and mountain biking routes in the Great Smoky Mountains and in the immediate areas just outside of the national park. Please click here to visit the page. Finally, the last addition I wanted to let everyone know about is our new “Place Names in the Smoky Mountains” page. This is a list of more than 45 place names and regional terms to help explain the meaning and historical origins of some of the names and places in the Smokies that may have had you asking “where did that name come from?" or "what in the world does that mean?". Please click here to visit the page. I would love to hear your feedback about any or all of these new additions. Particularly, do they provide useful information? Am I missing anything? Any recommendations on anything that I could add or change to strengthen the information would be greatly appreciated. Even our national parks are beginning to promote some aggressive offers to woo your entertainment and travel dollars. Below are a few examples of some of the offers that you can take advantage of right now if you’re thinking about getting away for a little R & R in a spectacular setting. Close to home, Shenandoah National Park is offering an "Early Bird Special" rate of $104 for a room for two at either the Skyland Resort or the Big Meadows Lodge. Book a stay at one of the park's lodges for a visit between April 12th and June 25th and you'll save roughly 33% off normal lodging cost. The offer is only good for visits on Mondays through Thursdays. The package, which includes breakfast, taxes, utility surcharge and meal gratuities, is good at the Skyland Resort from April 12th through June 25th. At Big Meadows, the same deal runs May 25th through June 25th. To take advantage of these savings you must book the deal online. Please click here for more information. Glacier Park, Inc., the concessionaire that runs the historic lodges in Glacier and adjacent Waterton Lakes National Park, have an excellent offer for people wishing to visit the park in June. The company is offering a 20 percent discount for two-night stays. A 30% discount for three-night stays, and a four-night stay is discounted 40 percent, according to GLI. The deals are good only for June visits and only when booked through the company's central reservations office at 406-892-2525. This offer is not valid when reservations are made online. The promotion code is E-CLUB. Through the end of February you can land a room in Olympic National Park with a 50 percent discount on your second night. The deal is being offered at Kalaloch Lodge, which is inside the park's southwestern corner, and Lake Quinault Lodge, which is just outside of the southern border. Yosemite National Park is offering limited time only spot deals on very specific dates at the world famous 4-diamond Ahwahnee Lodge, as well as in some of the other park accommodations. Click here for more information. Finally, Death Valley National Park is offering discounts for people over the age of 60 at the Furnace Creek Inn and the Furnace Creek Ranch. For a one-night stay, any day of the week, seniors receive a 10 percent discount off the normal rate at both the locations. For two-night stays, the discount increases to 20 percent for the room for both nights, and three or more nights will result in a 30 percent discount off the normal room price. You can take advantage of these discounts by clicking here or you can call 1-800-236-7916. If you’re planning a vacation to one of the other national parks, or any state park for that matter, make sure to call and check park web sites to find similar deals throughout the year. Amazon just announced the release date for their new Kindle 2, the next generation wireless reading device. Kindle is a convenient, portable reading device that gives you the ability to wirelessly download books, newspapers, magazines, and blogs. It utilizes a revolutionary new display technology called electronic paper, which provides for an exceptional reading experience. Reading Kindle's screen is as sharp and natural as reading ink on paper. 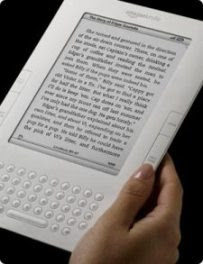 Kindle is also completely mobile; using the same network as advanced cell phones, Amazon delivers content using their own wireless delivery system, called Whispernet. Unlike Wi-Fi, you'll never need to locate a hotspot. There are no confusing service plans, yearly contracts, or monthly wireless bills either. The new Kindle 2 has a sleeker design and has seven times more storage capacity, holding over 1500 books now. It also has a longer battery life as well as faster page turns. Amazon’s Kindle Store has more than 230,000 books available for download, plus top newspapers, magazines, and blogs. Amazon’s vision is to have every book ever printed, in any language, made available on Kindle. Their wireless network allows you to download books right from your Kindle, anytime, anywhere; and delivered in less than 60 seconds. Many of their books, including New York Times Best Sellers and New Releases are $9.99 or less. The new Kindle 2 also has a new Text-to-Speech feature, which allows it to read every book, blog, magazine, and newspaper out loud to you. You can switch back and forth between reading and listening, and your spot is automatically saved. The original Kindle sold out quickly and was out of stock for the last two holiday selling seasons as Amazon underestimated demand. The company is hopeful that they will be able to stay in stock with the new Kindle 2. The new Kindle ships Feb. 24. Order Kindle now to reserve your place in line. They prioritize orders on a first come, first served basis. Danny Bernstein, an avid hiker and author of “Hiking the Carolina Mountains”, will be giving a presentation and slide show in the Kaplan Auditorium of the Henderson County Public Library on February 19 at 4 p.m.
Bernstein has hiked the entire length of the Appalachian Trail, has reached the summit of every mountain higher than 6000 feet in elevation in the Southern Appalachians, and is currently working on becoming a member of the 900 Miler Club, reserved only for people who have hiked every trail in Great Smoky Mountains National Park. Her book, Hiking the Carolina Mountains, is the definitive hiker's guide to the mountains of North and South Carolina. Published in April 2007, Hiking the Carolina Mountains takes you beyond the most well-known hikes in the region. This is the first hiking guidebook to include Dupont State Forest, Panthertown Valley near Cashiers, and the Green River Game Lands near Hendersonville in North Carolina. It also lists eight hikes in upstate South Carolina, an area largely undocumented in other guidebooks. She’s currently in the process of finishing up her latest guide book, “Hiking North Carolina's Mountain Heritage,” which will be released in late March. The program is free and open to the public. The library is located at 301 N Washington St in Hendersonville, NC. Please call 828-697-4725 for more information. Below is a link for the National Geographic photo contest winners for their "Best of the National Parks" photos. I know these were published last summer, but I just recently came across them. There are some outstanding pictures in this collection, including photos from Yosemite, Bryce Canyon, and my favorite from this collection, Yellowstone. Don't forget your special Valentine on February 14! Amazon has a ton of great gift ideas for him or her, along with some outstanding deals. Click on the logo below for more information. Backpacker Magazine recently published on their website an in-depth primer on "How to do Everything" from their November issue. This is an excellent read for all you newby hikers and campers out there, and is a good refresher course for experienced hikers as well. This comprehensive guide is packed with the backcountry secrets that separate average campers from true wilderness experts. As of February 4, each of the roads listed below remain closed in GSMNP. Snow showers and windy conditions will continue throughout the day and into tonight. Total additional snow accumulations of up to 5 inches is expected, with frigid temperatures and wind chills expected today and tonight. As a result of the snow and icy conditions today, many roads in Great Smoky Mountains National Park have been temporarily closed. • Forge Creek Road in Cades Cove will be closed until mid-March due to mud. More snow is expected tonight and tomorrow, with possible accumulations of one to four inches. There's a chance for even more snow on Wednesday as well. Please check back with the national park website, or call (865) 436-1200 to find out when these roads will reopen again. You've probably seen the pictures floating around the internet or in your email box. Pilgrims, hikers and adventurers walking across wooden platforms precariously situated on the face of a cliff on some remote mountain in China. Well, we now have someone who was brave enough to make the trek to Mt. Hua in China to film his experience as he crossed his way over what some people are calling "The World's Most Dangerous Hike". The video below was shot as part of a television show hosted by Robin Esrock. You can find more video and photos from Robin over at his website ModernGonzo.com.